I forgot to update about the garden in April. We had a lot going on and though my intentions were very, very good, I … well, I just forgot. But I do have some pictures that I hope will be helpful to my future self when I begin planting again next year. At least I remembered to keep my notebook with dates and seed name and brands, right? The herb bed continues to look a bit sparse, but you can see lettuce starting to pop up as well as some Swiss chard (planted in the front closest to us). The lettuce did not all sprout and I won’t buy Rocky Mountain Lettuce again. It has done pretty poorly compared to the other variety of lettuce I planted. In the containers, I planted lettuce, but we’ve harvest very little from them. I won’t even bother with container gardening next year. I thought it would give visual variety, but the rain and birds destroyed them. Not worth the effort. 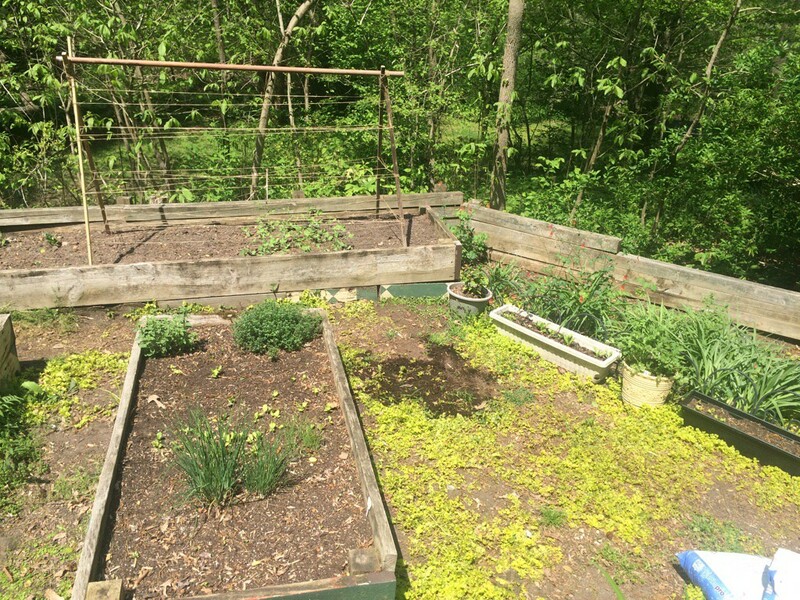 The back bed in the above picture – you can see the peas sprouted along with our make shift trellis. Another thing that didn’t really go all that well. The trellis looks great in this picture, but … well, I’ll update in May how it’s doing. We also had a varmint get into our garden to chase a skink around and ended up digging up several of my peas and the Swiss chard along the right hand side of the back bed. I replanted in the hopes that we’d have the amount of peas we wanted and I really wanted to try my hand at Swiss chard. 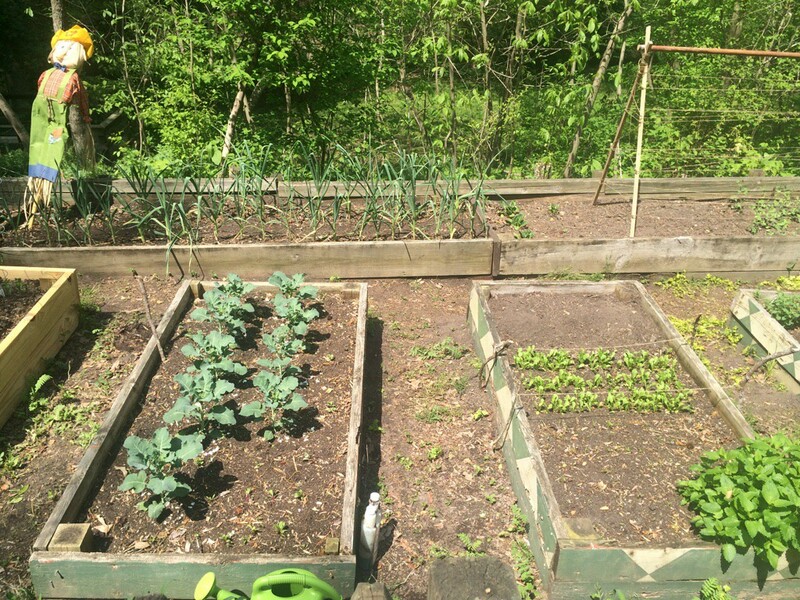 The spinach on the left of this bed looks a little sad but I added some fertilizer and bone meal to the soil and I think we might get some spinach after all. 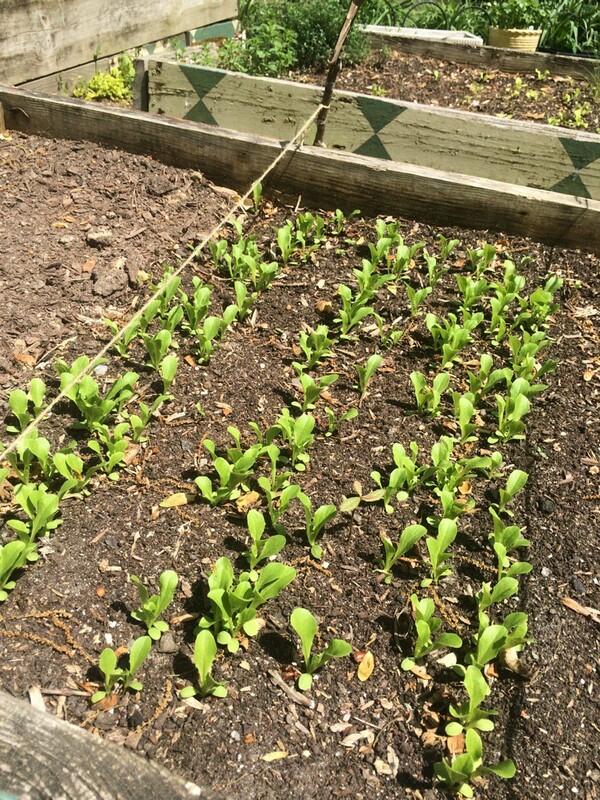 Our Parris Island lettuce is coming up very, very nicely! It’s doing much better than the Rocky Mountain lettuce mix. This is exciting because I’ve never had a great harvest of lettuce. Fingers crossed. 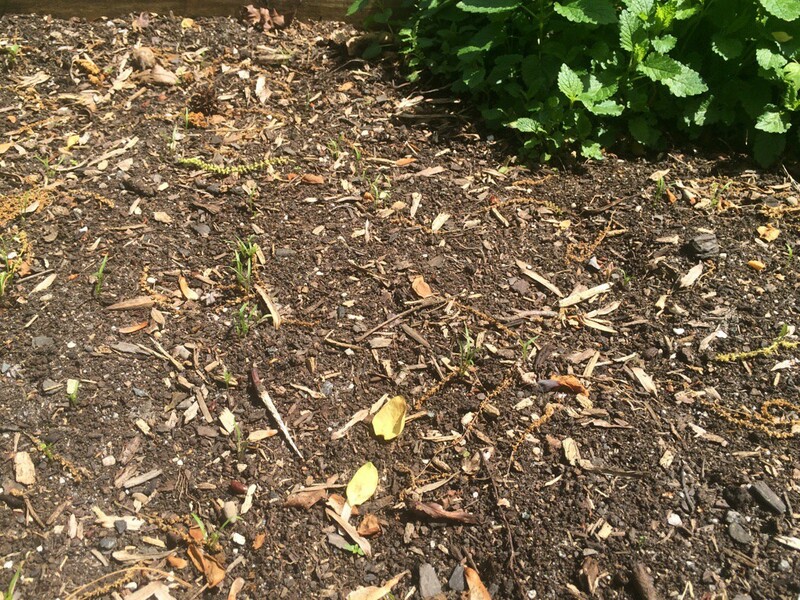 It’s hard to see, but there are SPROUTS for our carrots. With all the rain, I was worried my seeds were just washed away, but it looks like most all of them took. I look forward to thinning them in a few weeks. 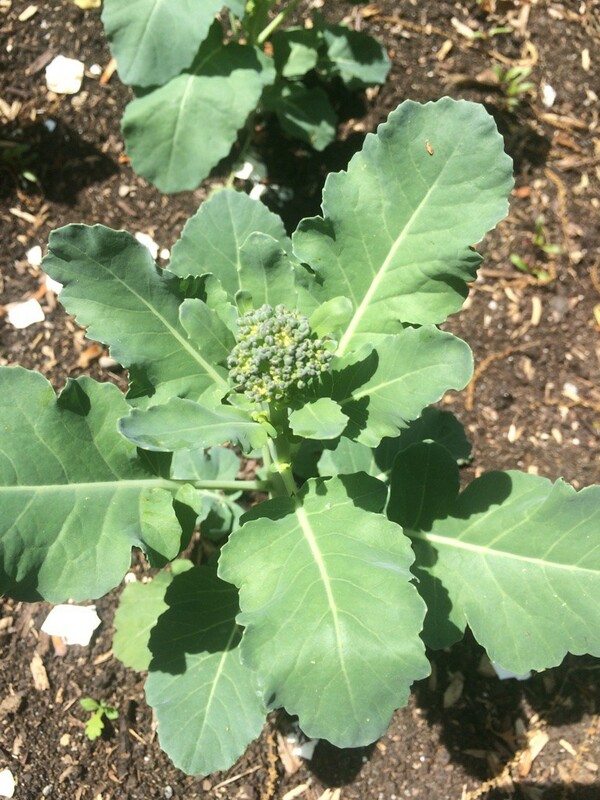 Our broccoli plants that I put in for an experiment looks great. They have really grown! Broccoli is even starting fruit. Exciting! 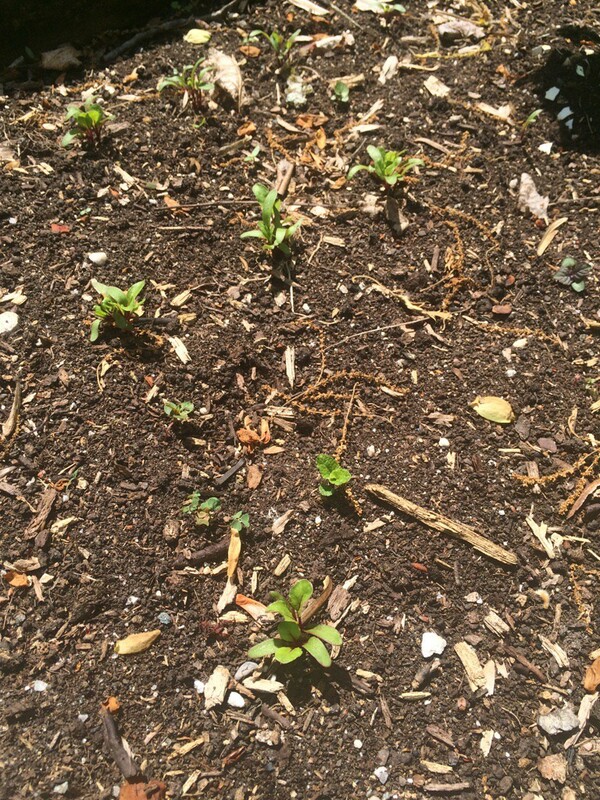 The beets have sprouted and almost ready for me to come through to thin. I planted them in with the broccoli so we’ll see how they do. 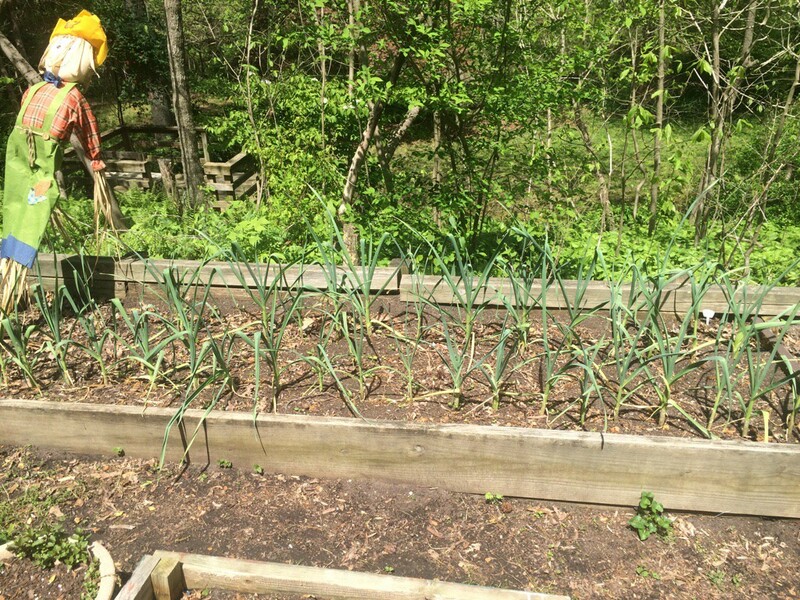 The garlic continues to grow and the base is looking much more sturdy this month. We built our other two beds, but I don’t have a picture. You’ll see them next month though!